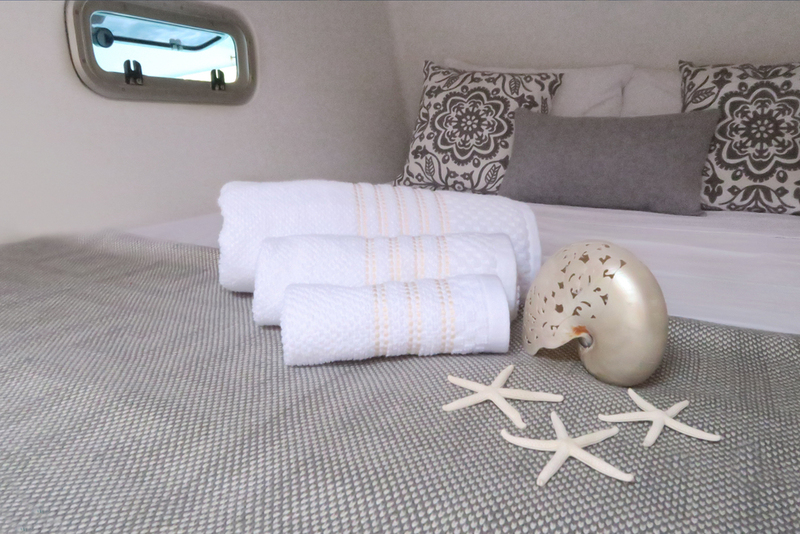 Segue offers two midships queen guest cabins with ensuite heads and showers. There is an indoor dining area and lots of places to curl up with a good book or play a board game. 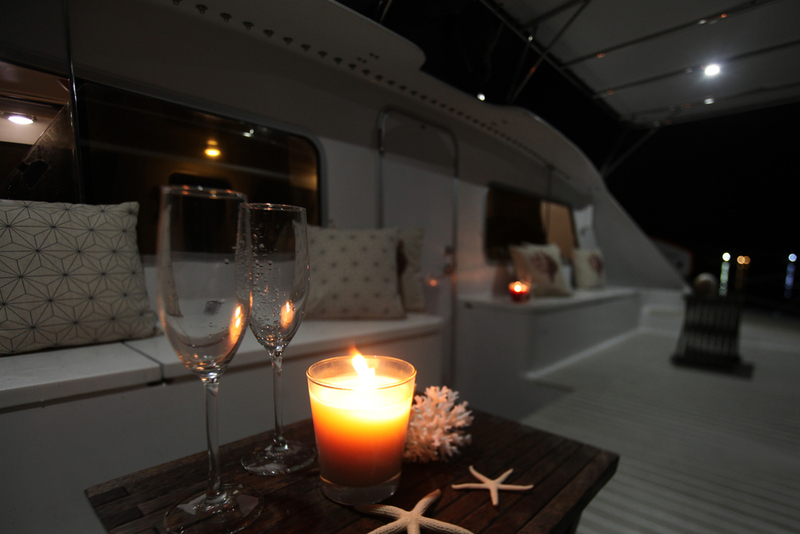 Sit on the sofa and review you dive video or take your favourite beverage to the vast aft deck and watch the sunset. 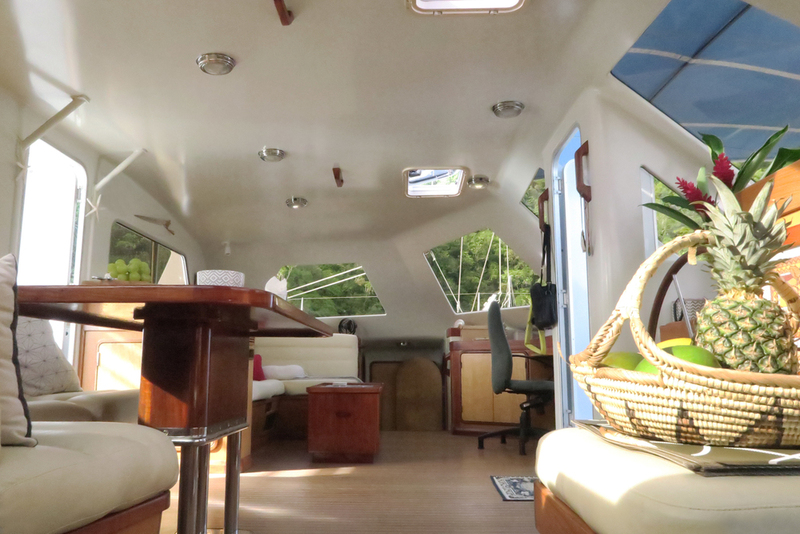 One of the best places on board is the webbing between the bows. Lay out, relax and listen to the ocean passing under you. Varnished cherry, mahogany or walnut, cabinet door frames, fiddles and trim. 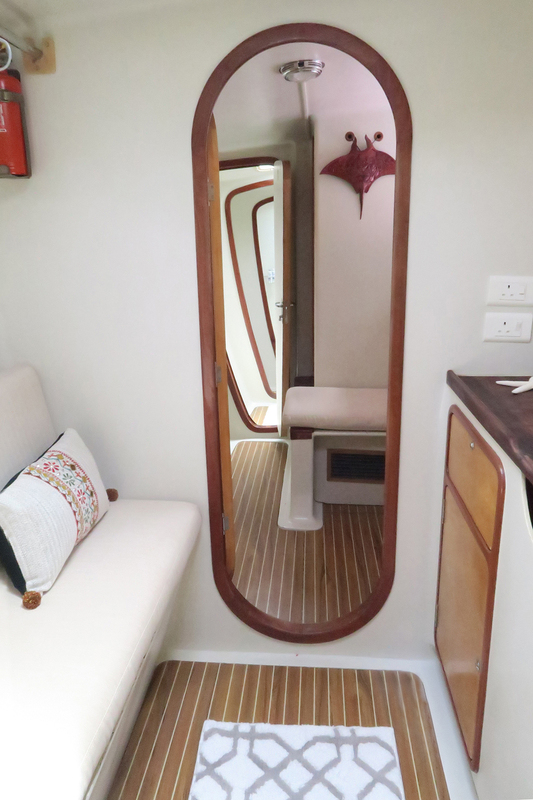 Teak and holly laminate soles in accommodation spaces. 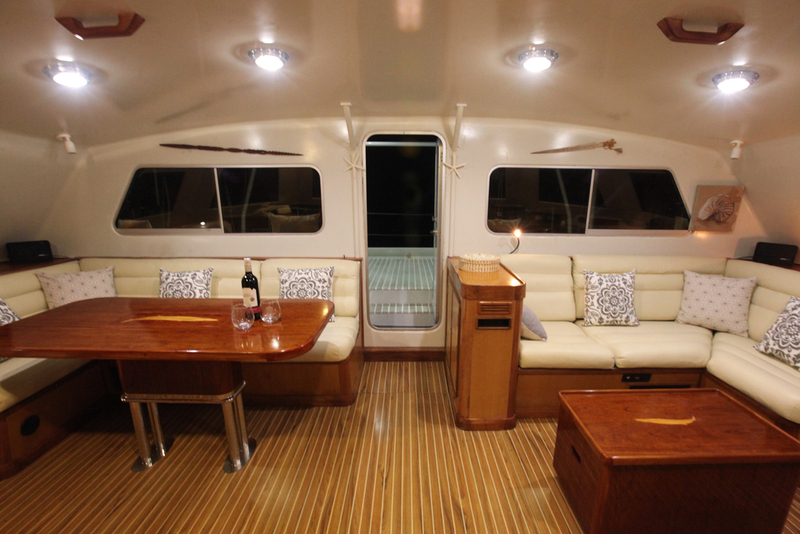 Ultesuede fabric for pilothouse settee seats and other cushions. 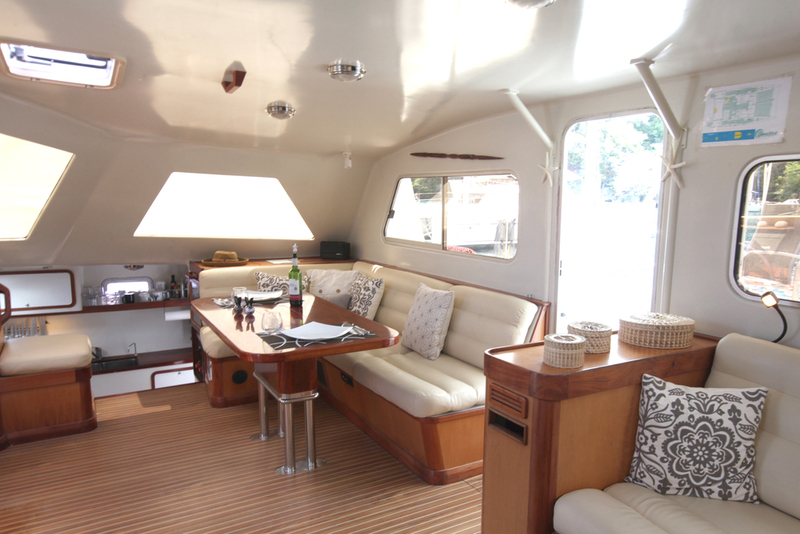 Port and starboard settee seats both have a varnished wood table. 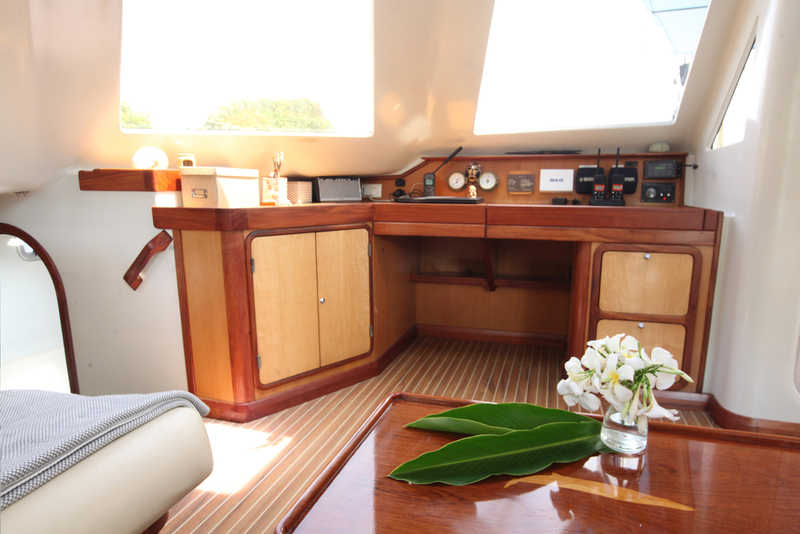 Port side table is a movable “coffee table”. 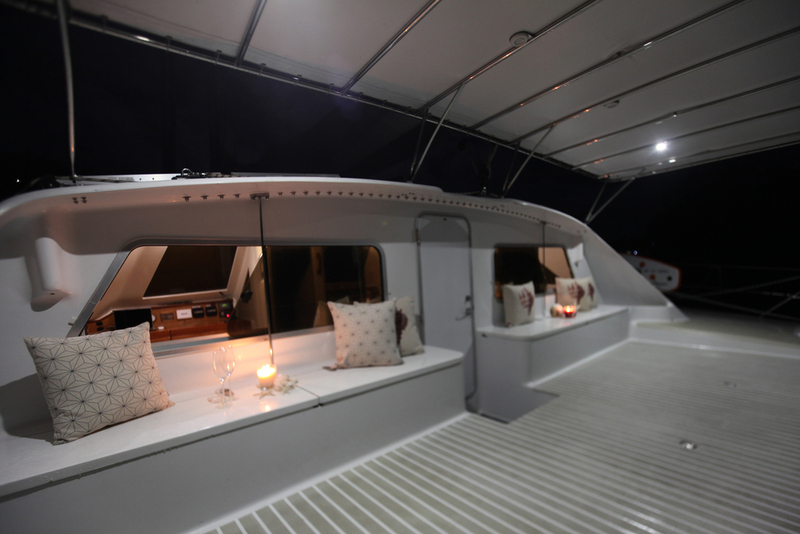 Starboard side table is a dining table configured so that it can be moved to the aft deck for open air dining. Settee seats have partitioned stowage beneath via lift out covers in the seat top. Extra large chart table measuring 55" x 34" with full size chart drawer beneath. Tank Tender, 4 tank monitor. Custom expansive permanent sun shade with 4 x 250 watt solar panels provides complete protection from sun and rain and is the ideal diving technical space. 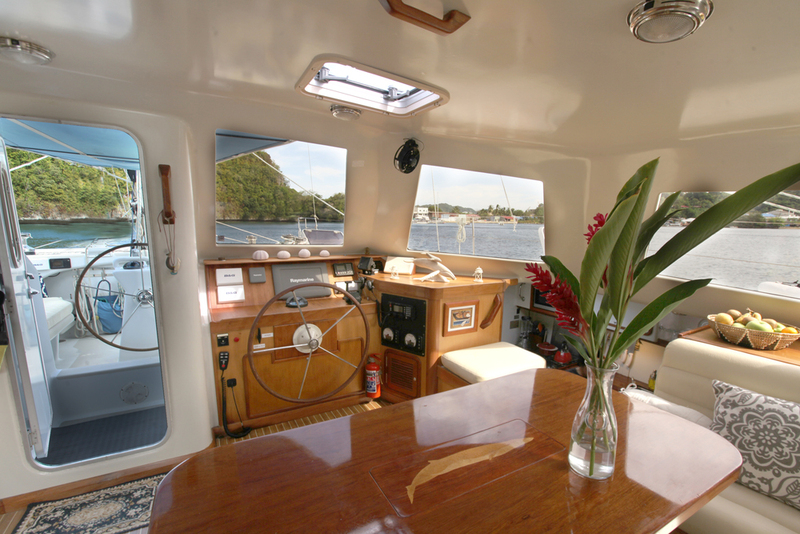 Dinghy hoist and dinghy tie downs built into the aft deck. 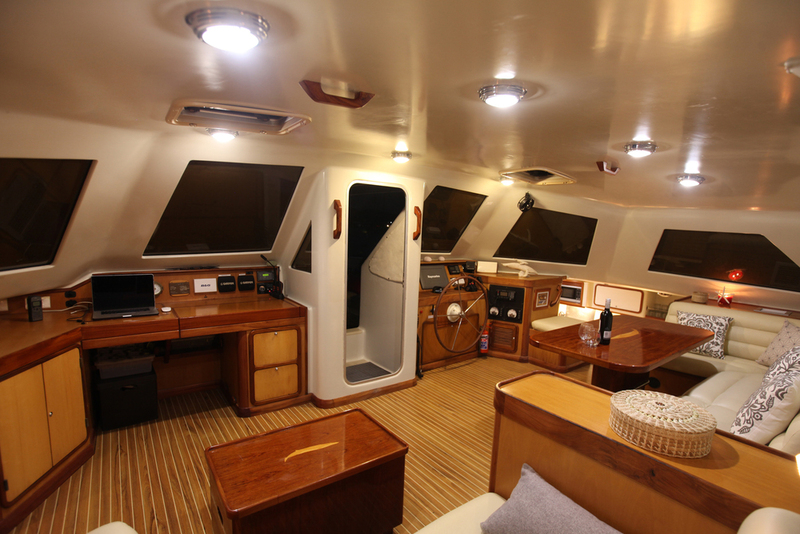 Four large flush deck lockers along the forward side of aft deck for stowage. Force 10 model, four burner propane stove with automatic temperature control oven and broiler. A remote solenoid propane shut-off switch is provided. Two 25lb. steel propane bottles are located in a self venting locker. Microwave oven installed in the galley over the propane stove. Galley sink is a deep double bowl polished stainless steel with strainers set flush into a Granicoat counter top. Hot and cold pressurized water delivered by Scandvik single lever mixer. Ample drawers, lockers and shelves for storage. 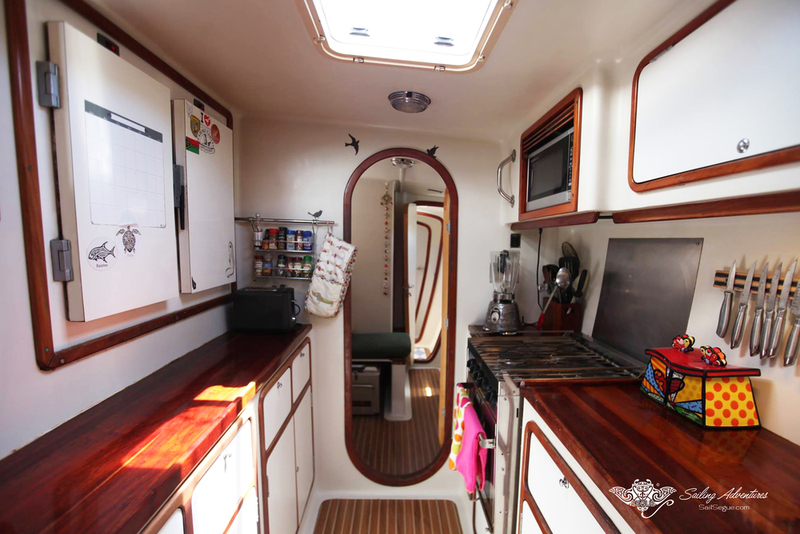 A custom fabricated side by side refrigerator/ freezer (7 and 5 cu/ft capacity) is located in the galley, inboard side. 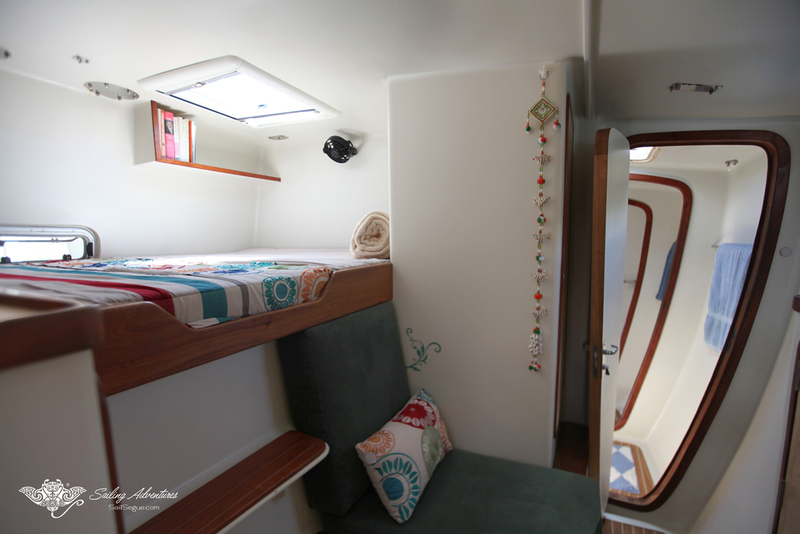 Adjustable shelves included in each compartment. Each unit uses a separate highly efficient Danfoss compressor with electronic control thermostat providing redundancy. A third chest freezer ensures adequate capacity for exceptional meals while away from populated areas. 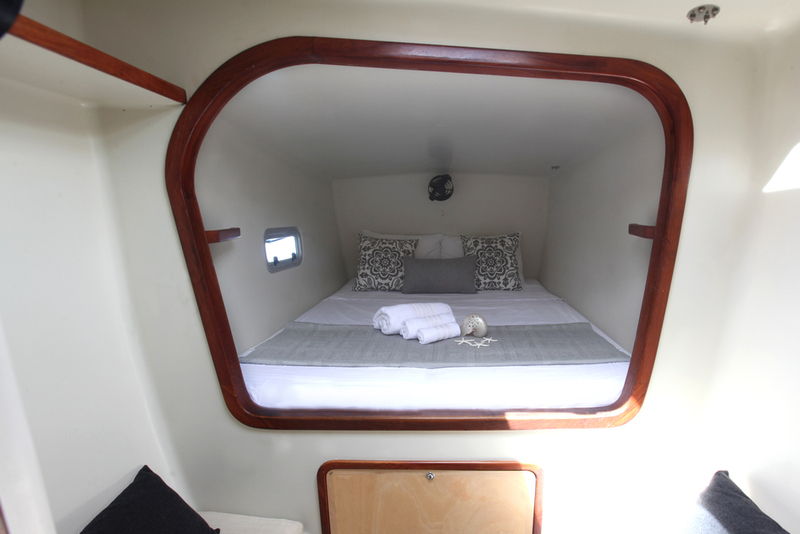 Each hull has a sleeping cabin amidships that contains a large queen sized berth. A hanging locker, built in dresser, storage cabinet and bookshelf is included. 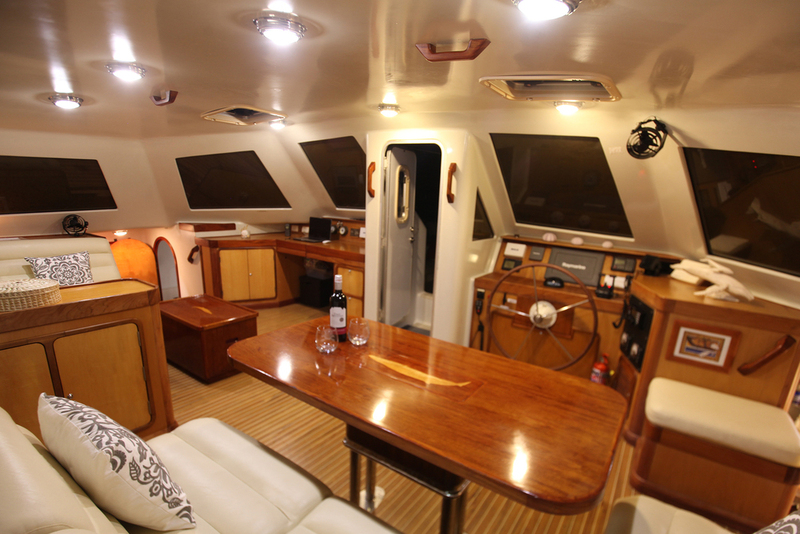 A large deck hatch and two opening ports provide ventilation. 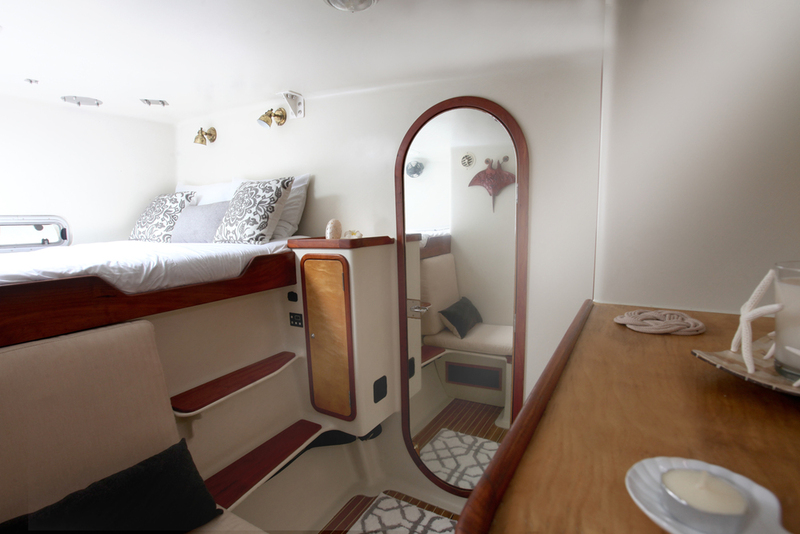 Each hull has a separate aft cabin which contains a double berth (60” wide, 80” long), large hanging locker, built in dresser, two bench seats with additional stowage beneath seats and berth. 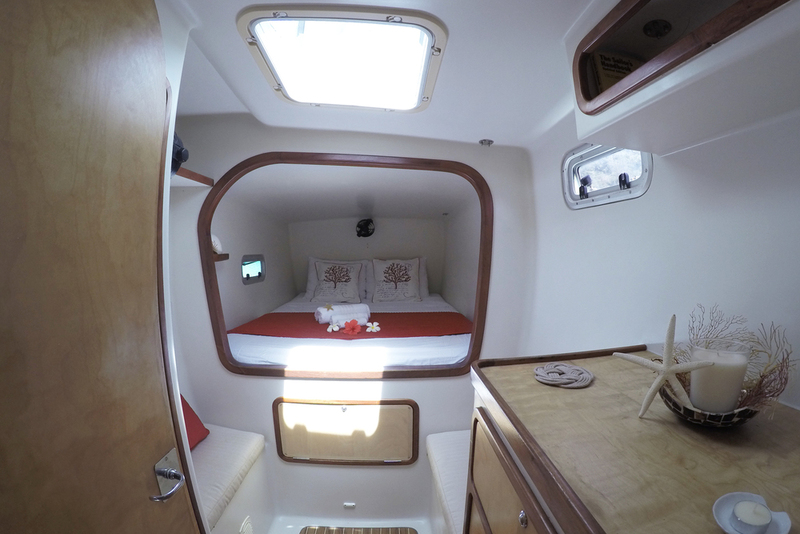 A deck hatch and opening ports provide excellent cross ventilation. Each head is equipped with a vanity with polished stainless steel sink with hot/cold pressure water via a Scandvik mixer. Granicoat laminate countertop and stowage locker beneath. Two large stowage lockers with shelves for towels, etc. are within easy reach. 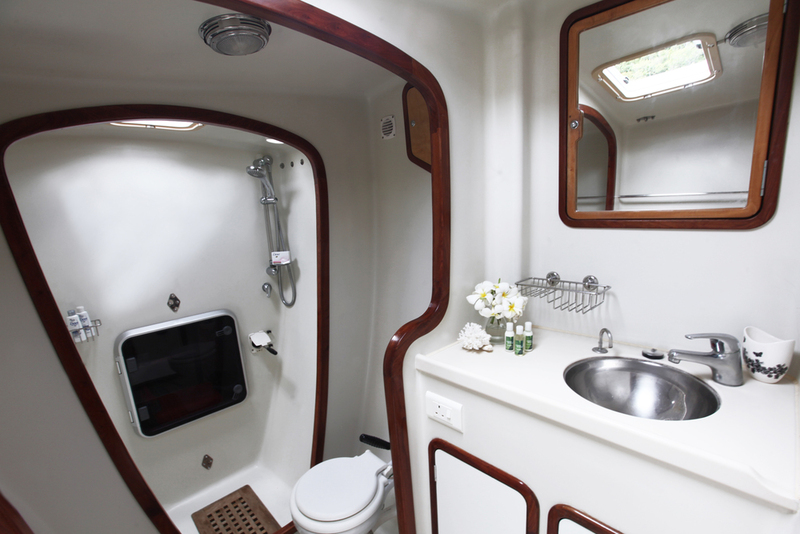 Lavac toilet plumbed to holding tank with valves for overboard discharge as well as pump out. Semi-gloss polyurethane finish for easy cleanup. Hot/cold pressure water with Scandvik single lever mixer. Isotemp 40 liter dual function (dockside power or engine heat exchanger) water heater. African Hardwood r with backing plate for vice. Drawers and lockers below for tool and parts storage.